Motorhead's 13th studio release is a maddeningly inconsistent effort, the line-up of Lemmy Kilmister, Phil Campbell and Mikkey Dee mixing some of the band's most sophisticated career tracks with a few pure throw-away cuts. A song list trimmed down to the eight selections would have had a much more powerful impact; as it stands, Eat The Gun, Love Can't Buy You Money and Them Not Me are minor league fillers that unfortunately trip up the album's quality. The three stand-out songs on Overnight Sensation are crammed into the front end. Civil War is powered by Lemmy's roaring bass and Mikkey Dee's artillery drums, the song matching the sounds of a chaotic conflict. 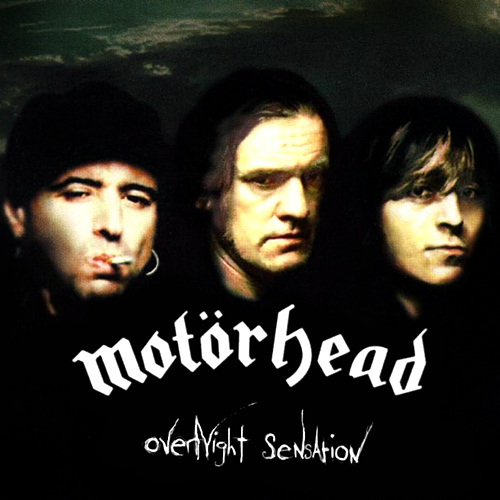 I Don't Believe A Word is a stunning demonstration of how far Motorhead have evolved: a slow, cultivated and steady pace providing a strong foundation for one of Lemmy's most mature and controlled vocals. The title track Overnight Sensation is in the same class, increasing the tempo and turning up the power dial but emphasizing authority over Motorhead's typical chaos. The back end of the album is more mundane, but closer Listen To Your Heart picks up the quality again and has echoes of the Overnight Sensation riff. On both tracks, Lemmy picks up the rhythm guitar and injects a new, almost cheerful sound that would have been trampled under the greasy boots of Motorhead 15 years prior. Overnight Sensation is a deep dark mine. There are veins of useful metal, but plenty of worthless chunks of grey stone to trip over. Produced by Howard Benson and Duane Barron. Mixed by Ryan Dorn and Duane Barron. Mastered by Dan Hersch.